World War II (1939 - 45) saw a surge of interest in the arts. Many civilian and military audiences experienced drama, opera and ballet for the first time. Unlike audiences in World War I (1914 - 18) who needed escapism, the audiences of the 1940s were looking for something more. CEMA, the Council for the Encouragement of Music and Arts, was set up to provide war time entertainment and money was given to ballet, opera and drama companies to perform in military camps and to civilians. During the war Sybil Thorndike and her husband Lewis Casson toured the mining villages of Wales performing Shakespeare and Greek tragedy and the Sadler's Wells Ballet, Sadler's Wells Opera and symphony orchestras performed in military camps across the country. In London's West End serious plays were performed to full houses and at the Arts Theatre there were four ballet performances a day - Lunch Ballet, After-Lunch Ballet, Tea Ballet and Sherry Ballet when audiences could eat during the performance and then return to work. The interest in the arts during World War II led to the first government subsidy of the arts in Britain with the founding of the Arts Council in 1946, championed by Jenny Lee. The naval signal on the right is an advertisement for a show put on by the Grant Anderson Company for the troops in Tunisia. 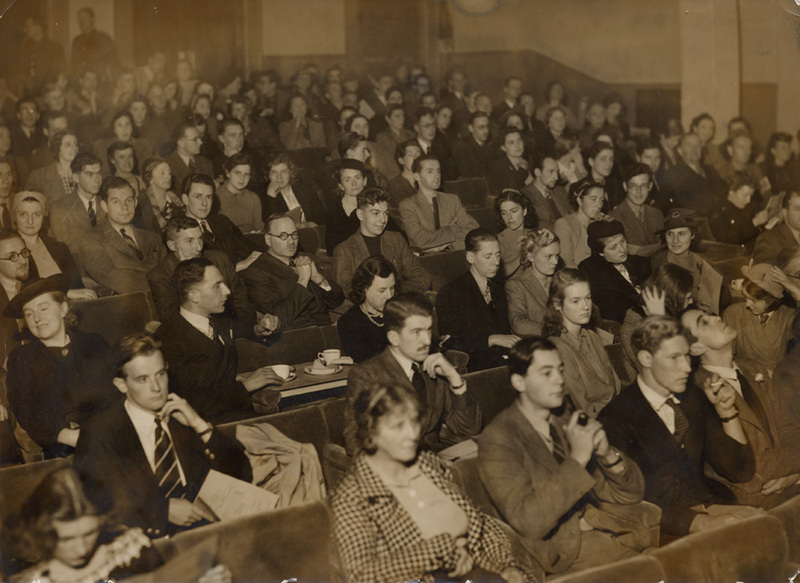 Throughout World War II, an organisation called Entertainments National Service Association (ENSA) coordinated entertainments all over the world, wherever allied troops were stationed. The Grant Andersons were recruited and sent all over the world. Many performers had to live and work in harsh, uncomfortable conditions. Performances might take place in a purpose-built theatre or on portable stages in the open air. There were shows in submarines, on the decks of ships, in aircraft hangers and there were usually several shows a day. ENSA shows went on through sandstorms in the desert, snowstorms in Italy, rainstorms in the Pacific and sometimes very close to the front line. 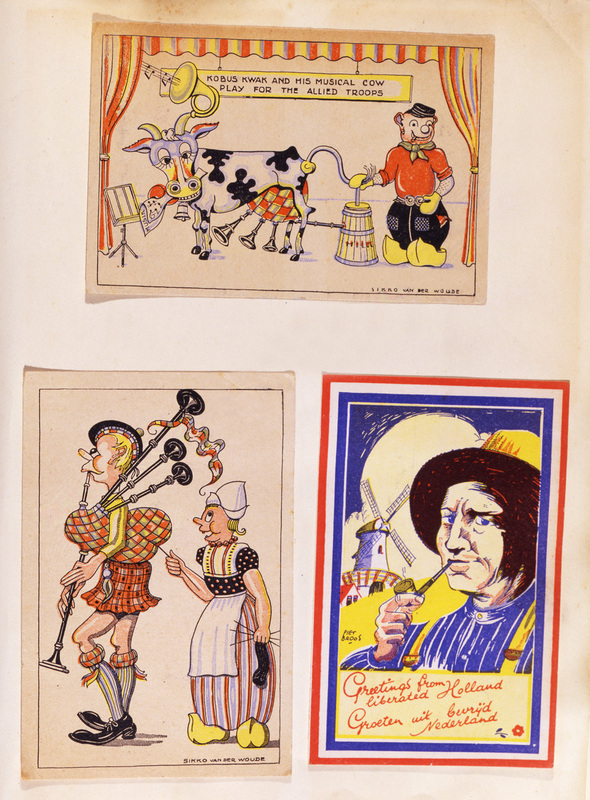 These comedy postcards, Kobus Kwak and his Musical Cow play for the allied troops and Greetings from Liberated Holland, are part of a scrapbook collection by Jimmy and Lena Grant Anderson who toured as army entertainers with their little variety company during World War II for ENSA. As soon as war was announced on 3 September 1939, the theatre producer Basil Dean set up ENSA and by 11 September, had taken over the Theatre Royal, Drury Lane as its headquarters. Dean had been a pioneer of troop entertainment during World War I. Even with his experience, it was a huge project to administer and from the outset there were problems. One theatre manager recalled arriving at an army base in north Yorkshire to find that no-one was expecting them. Only 150 men could be rustled up as an audience, and then they were interrupted mid-show by a furious brigadier. They had been sent to completely the wrong place and 2,000 troops had been waiting elsewhere for an hour and a half. This is a page from a scrapbook kept by an actor, Jimmy Grant Anderson, working for Entertainments National Service Association (ENSA) during World War II. ENSA sent shows to all parts of the world where troops were stationed. This scrapbook includes souvenirs from Italy, Malta, Algeria, Tunisia, Morocco, Gibraltar, Spain, Belgium, Holland, Germany, India, Malaya and Burma. 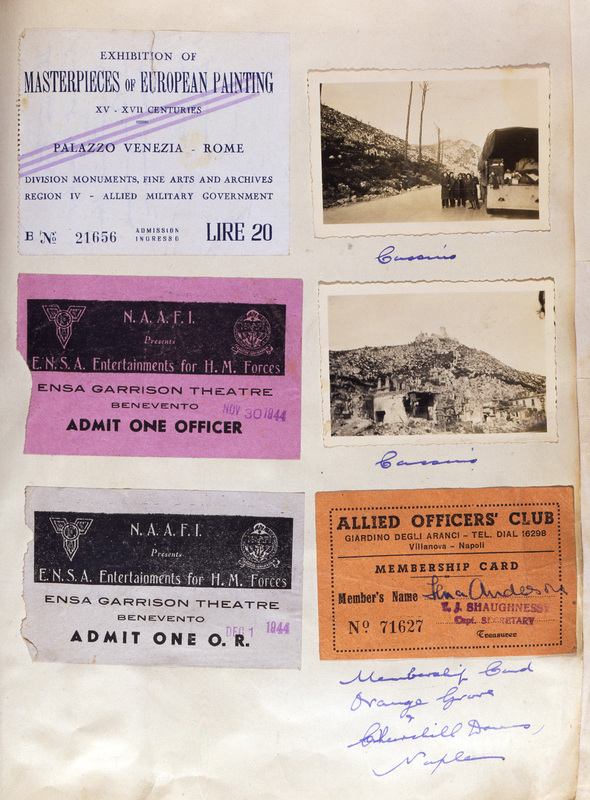 The tickets and postcards on this page are from Italy. There is an entrance ticket for an exhibition in the Palazzio Venezia, Rome as well as two tickets for the show itself, held in the Navy, Army and Air Force Institutes (NAAFI) theatre. (The NAAFI is the organisation that provides shops, clubs, bars, and restaurants for the British armed forces on every base where they are stationed.) The two postcards are of Cassino, south west of Rome. On the hillside behind the town is the medieval monastery of Monte Cassino that was bombed in 1944. The Arts Theatre Club in London's West End opened in 1927 to provide 'the amenities of a London Club and a congenial place for those interested in the theatre on both sides of the curtain'. Because it was a club it was not subject to normal censorship regulations and could stage unusual productions even if they had been banned by the Lord Chamberlain. During World War II ballet became extremely popular and the Arts Theatre put on daytime performances of ballets. From 1940 the hour long Lunchtime Ballet was packed daily with civilians grabbing a sandwich before returning to work and servicemen on leave. It proved so successful that an After Lunch Ballet performance was added, then Tea Ballet followed by an After Tea Ballet and by 1941 an early evening Sherry Ballet. 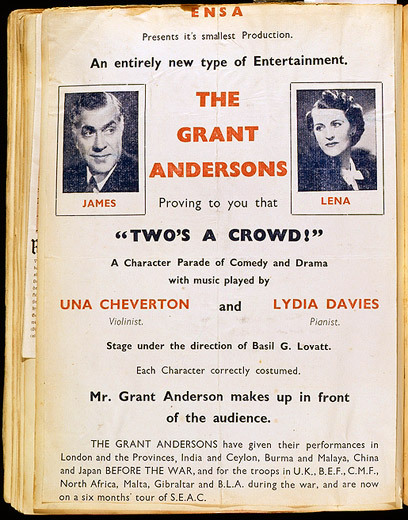 This flyer advertises A Character Parade of Comedy and Drama by the Grant Andersons. The company toured South East Asia for six months under the direction of ENSA, who organised entertainments for the troops. The Grant Andersons became one of the more popular and well established ENSA companies. They usually toured with about six actors, although it looks as if they did not have their full quota for this tour, as it is billed as ENSA's 'smallest production'. Organising entertainment on this scale was not easy, given transport in wartime, nor could every act be guaranteed to be of high quality. ENSA, which actually stood for 'Entertainments National Service Association' was usually known as 'Every Night Something Awful'. Jack Hawkins, who administered ENSA's shows in India, complained that he was only sent the 'flotsam and jetsam no one else wanted'. By the end of 1944 ENSA had employed over 4,000 performers who had played to millions of soldiers. Four out of five members of the acting profession appeared in an ENSA production at some time during the war. Conditions at different camps in different countries were varied. Performers might find themselves billeted in a pleasant hotel in Rome, and a few months later, sleeping under canvas in the jungle in Burma. They were usually invited to the Officers' Mess (where the officers were served their food, separate from the men). Sometimes this could be rather a trial, since after a long journey and at least two shows they were tired, and the last thing they wanted was to have to be chatty and entertaining. Everyone wanted to hear news from home. It was especially difficult for the women. The officers welcomed new female company and actresses were always thought to be glamorous and exciting - neither of which was always possible in a rainy jungle. Anderson and his company performed for Allied troops all over the world under the direction of ENSA. When ENSA was started its director, Basil Dean, intended to include plays in the repertoire, as well as variety shows. The first play to be performed for the troops was called Eight Bells and the soldiers stayed away in droves. The average audience over the first five shows was ten people. By its sixth performance, only one soldier bothered to turn up and the play was withdrawn. Dean persevered and plays, opera, ballet, and orchestral concerts later featured in ENSA programmes. However, variety 'concert parties' remained standard ENSA fare, made up of solo performers or double acts who then worked up some group numbers as well. The first Stage Door Canteen was opened in New York in 1942, the brainchild of Antoinette Perry (in whose memory the New York Tony awards are named) of the American Theatre Wing. The Canteen provided free relaxation and amusement for uniformed servicemen. Branches were later established in major American centres, London and, following the Liberation of Europe, Paris. 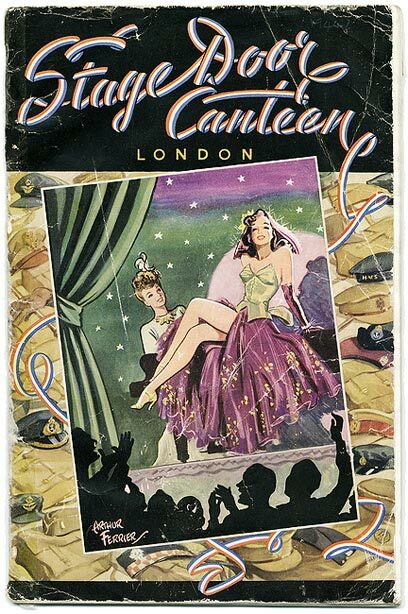 London's Stage Door Canteen in Piccadilly was run by the NAAFI (Navy, Army and Air Force Institutes) and passing showbiz stars 'dropped in' to perform, supported by young performers, often themselves in uniform. On one famous night in September 1944, the cast included Fred Astaire, Bing Crosby, Jack Buchanan, Beatrice Lillie and opera star Joan Hammond. In New York, celebrities like Marlene Dietrich served drinks or worked on the cloakroom. In London, the Canteen continued for a few years after the war and in 1946 an 11 year old Julie Andrews sang the 'Polonaise' from Mignon before the Queen (later Queen Elizabeth the Queen Mother) and Princess Margaret. The Canteens were used as the background for the 1943 film Stage Door Canteen, a literally star-studded musical drama, largely financed by the Theatre Guild, with all proceeds going to various wartime fundraising concerns. Countless British and American celebrities put in an appearance - everyone from Katharine Hepburn to Gracie Fields, Count Basie to Benny Goodman. This programme and cutting are from a scrapbook kept by an actor, Jimmy Grant Anderson, who toured the world entertaining the troops during World War II. Almost the entire theatrical profession was recruited to the cause, along with a huge number of hopefuls who would never otherwise have been given a chance to perform. There is a saying that war is 5% fun, 5% fear and 90% boredom. ENSA's mission was to give the armed forces some relief from tension and boredom and to remind them of their homes in Britain. 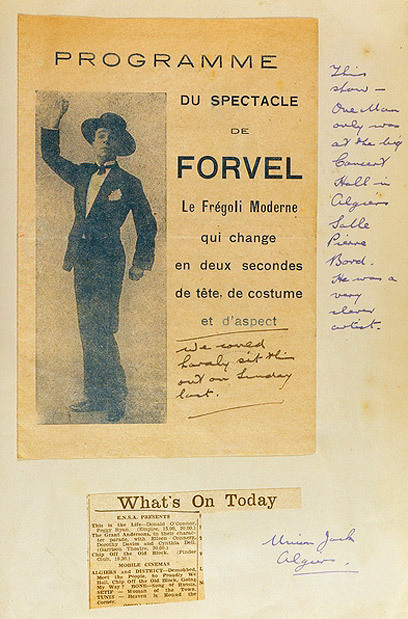 This programme advertises Forvel 'who changes in two seconds', and who was appearing at the Concert Hall in Algiers. He presented 22 individual characters in their own little scenes, and finished with a party in a nightclub, in which he played 14 different people.